NETWORK UPDATE: SUNDAY NIGHT FOOTBALL adjusted to 6.1 in final numbers, down 0.9 from last Sunday’s game. FOX’s MISS UNIVERSE PAGEANT lost 0.1. After adjustments for the late afternoon NFL overrun, 60 MINUTES gained 0.1, and UNDERCOVER BOSS climbed 0.2. CABLE HIGHLIGHTS: Either Showtime or Nielsen mislabeled the season finales of HOMELAND and THE AFFAIR as reruns, which is why they’re not on the chart below. Both did quite well: HOMELAND rose 0.11 to a season-high 0.70, and AFFAIR set a new series high, up a tenth to 0.34. Meanwhile, Starz’s FLESH & BONE (which has its limited series finale next week) doubled to 0.06. The Sunday action, however, was largely in the unscripted realm. 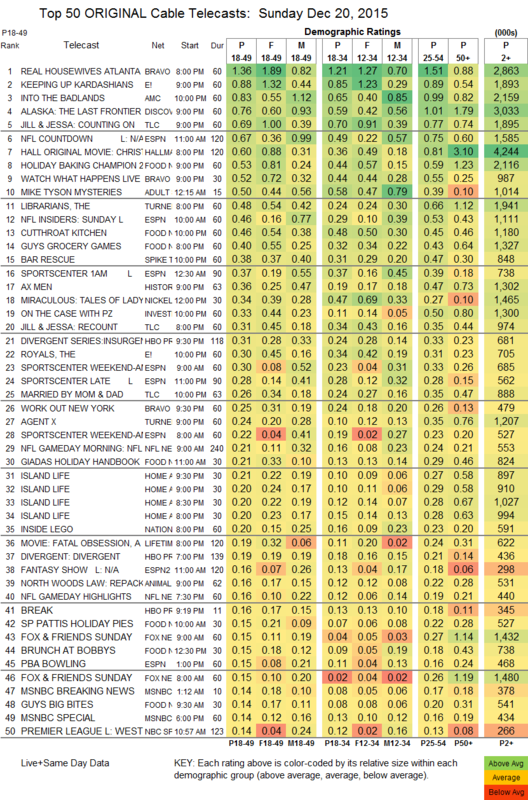 On Bravo, REAL HOUSEWIVES OF ATLANTA edged down 0.03 but was still dominant at 1.36, with WORK OUT NY down 0.07 to 0.25. On E!, KEEPING UP WITH THE KARDASHIANS slipped 0.06 to 0.88, followed by a 0.02 rise for THE ROYALS to 0.30. Discovery’s ALASKA: THE LAST FRONTIER gained 0.07 to 0.76. TLC’s JILL & JESSA lost 0.08 to 0.69, and MARRIED BY MOM & DAD lost 0.12 to 0.26. A bit lower, Hallmark’s CHRISTMAS LAND movie was at 0.60. On Food Network, HOLIDAY BAKING CHAMPIONSHIP climbed 0.06 to 0.53, CUTTHROAT KITCHEN rose 0.11 to 0.46, and GUY’S GROCERY GAMES gained 0.02 to 0.40. Adult Swim’s MIKE TYSON MYSTERIES was at 0.50. 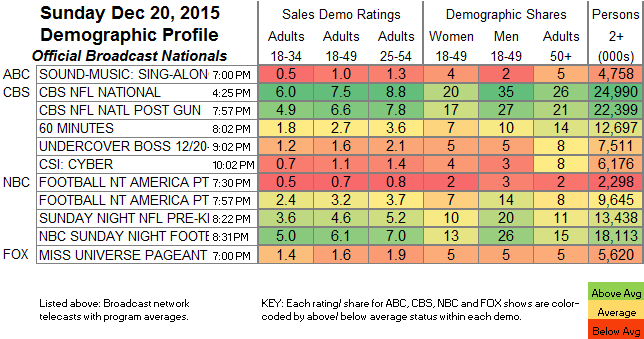 On TNT, THE LIBRARIANS dropped 0.12 to 0.48, while the recently canceled AGENT X fell 0.04 to 0.24. Spike’s BAR RESCUE dropped 0.09 to 0.38. History’s AX MEN lost 0.08 to 0.36. Logo’s RUPAUL’S DRAG RACE was at 0.02/77K. Top 150 Original Cable Telecasts To search for a show: type Ctrl-F and type your show title in the search box.